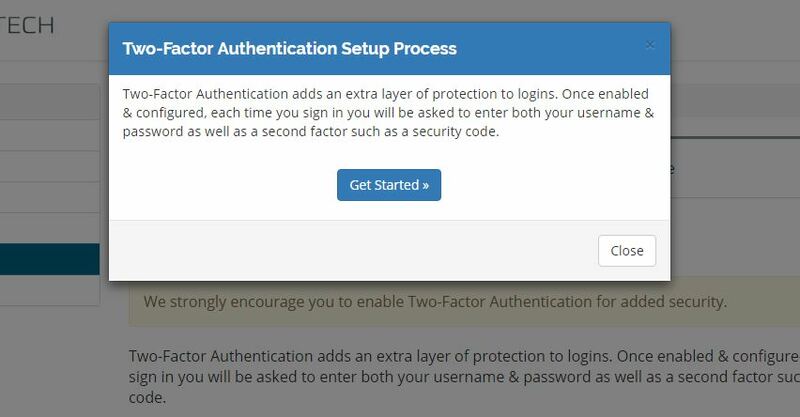 To enable Two-Factor Authentication for logging into your services, billing & support portal account with us (https://manage.veerotech.net) please follow the steps below. Once you have logged into your account at https://manage.veerotech.net please click the Account, Security & Billing green button. On the Edit Account Information page, you’ll want to click the Security Settings tab as shown below. Next, click the button titled Click here to Enable. 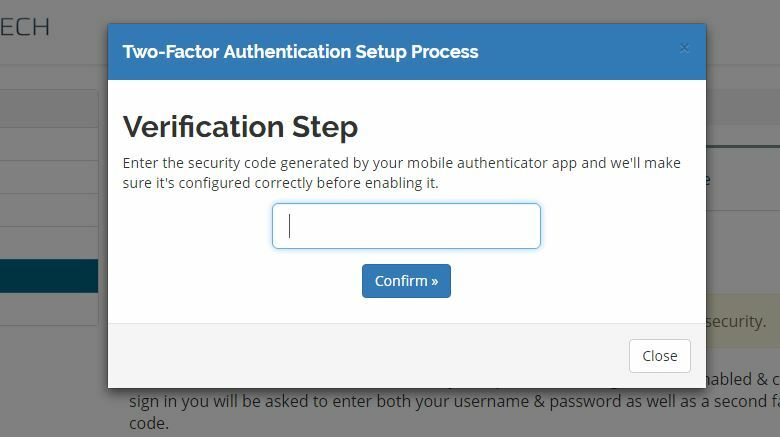 You’ll be presented with the get started wizard for configuring your Two-Factor Authentication. Once you’ve read the description, please click the button shown above titled Get Started. On the next step, you’ll be presented with a QR code similar to the one displayed below. We recommend scanning the QR code as it’s much easier. If you do not have a QR code scanner, you can alternatively enter the provided secret key manually. 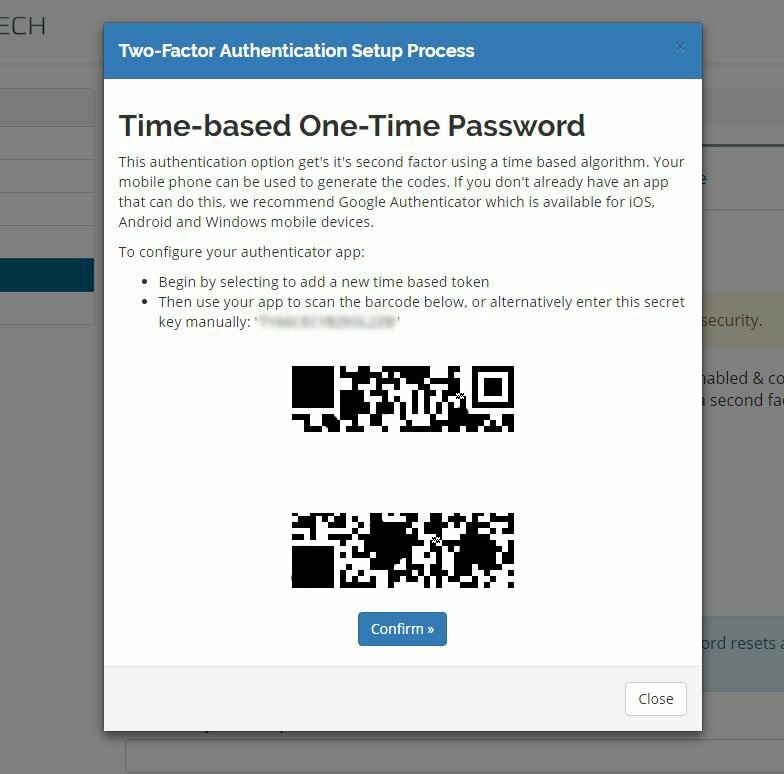 After you’ve scanned the QR code or entered the secret key into your devices authenticator, you’ll want to click Confirm. After, you’ll be prompted to enter the code provided on your device into the box shown below. After you’ve entered the code and clicked Confirm, we will then provide you with a backup code that can be used in the event of a problem with your authenticator. Please note: our staff does not have access to your authenticator OR the backup code. 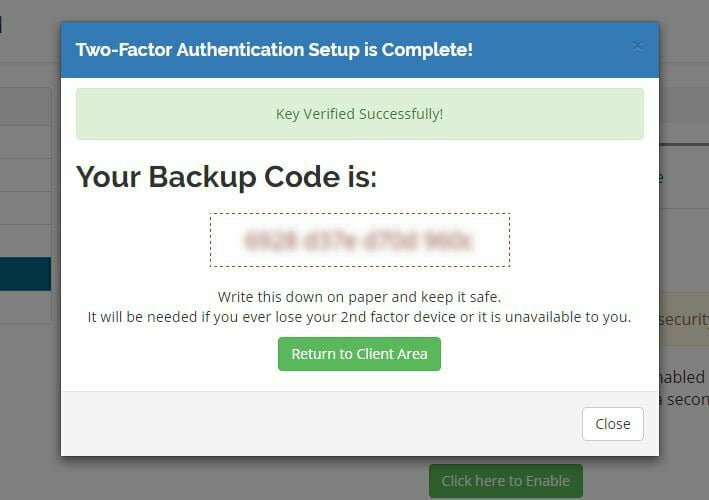 In the event you are unable to log in, you will need to contact us and verify ALL account information in order to have Two-Factor Authentication disabled. Please be sure to write down the backup code provided in case you are unable to log in with your authenticator.